I've made no secret of the fact that the late George Jones is my favorite recording artist. His ability to broadcast the sadness in his voice makes so many of his hits have a sense of realness that many other artists can hardly touch. I try to embed that emotion into my music, when I record, although I'm no George Jones. 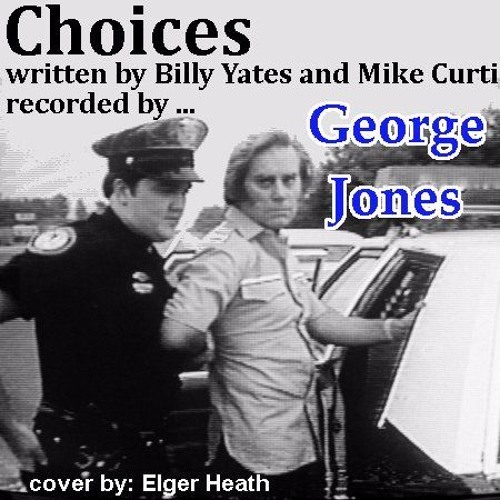 Written by Billy Yates and Mike Curtis 'Choices', released by George Jones in 1999, is a perfect example of the power of emotion put to music. Both the story and the voice portraying it make you feel if this is a real tragedy. George was no angel, through out his life and, truthfully, I think the hardships he suffered, due to his life choices, made him a far better artist over the years. It's not the way George would have wanted to come by success, but sometimes that's how it comes. I sure wouldn't have called him a role model but a great singer he certainly was. Here is my cover of this great George Jones hit, 'Choices'.